Apart from Amelia Windsor & Kitty Spencer, Sabrina Percy and Frankie Herbert (Earl of Carnarvon's niece) walked in the show. Lady Kitty comes off as kind of trashy and frankly Lady Amelia has zero respect for herself; they should be hiring real models, not playgirls. The one good thing about the D&G shows is though that they don't hire skeletons anymore. I hope the industry moves away from that madness. Yeah, Kitty is sure living off her connections and as "society girl"..
^Sad but riveting story behind the story. Is there a book about her life? There's no biography of Veronica Lucan as far as I know, but there are several books on the Lucan murder which was a famous one in Britain at the time. The book 'A Different Class of Murder' that is the review below goes into the backgrounds of Lucan and his wife and their marriage, as well as the murder, of course. It really is quite a story and I've always felt very sad for her, esp now it's touched me when I read she's died. It seems incredibly clear that he wanted to kill her, and yet all 3 of her kids have turnt their backs on her and taken their father's side, the youngest was at the time of the murder only 3 years old, so doesn't even remember him at all. This woman really had a life, deserted by all her family (in favour of her cad of a murderous husband), but seems to at least have had friends until the end. She published a book this year, and appeared in a docu, which is the closest we'll ever come to her and the story. I think ultimately this will remain forever a mystery. I don't understand why the book, published this year, is so obscure to find. PS Even if Lucan didn't intend to kill his wife but the poor nanny, the kids still flabbergast me to have chosen their father, a murderer of an innocent woman, who wanted to kill their mother! PPPS On the dm link above at the end it says "to be published later this year", article of from June. So maybe the book is still bound to be published, but should nonetheless be much much easier to find online, and be able to pre-order on Amazon.. 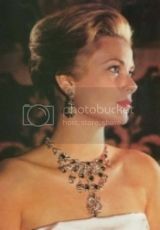 It's sad that Lady Lucan was permanently estranged from all three of her children. However, as far as finances go I'm not sure that she had very much to leave anyway. She didn't come from a wealthy or aristo background herself, and the Lucans have certainly never been wealthy. I remember at the time of the murder press reports stated that 'Lucky' Lucan was more or less a professional gambler. That's not a very secure way of making a living. Also, as Shkespeare writes, the house that Veronica Lucan died in was on a very long lease (not unusual in Mayfair and Belgravia.) No live-in servants, apparently. So I'd be surprised if she left a fortune. for the book and docu info!!! This has really caught my attention. I stumbled across this article from March from the Northumberland Gazette, writing about Max & Nora's impending wedding (even then it seems it was clear they'd wed in Germany, I don't remember whether this was poested at the time here, maybe even I posted it and forgot). Long question short: Does anyone know whether Katie is still married (to Patrick) or divorced? I looked further, seems they divorced in 2014? Why did the Northumb Gaz fail to report this? "They married in one of the biggest society weddings of 2011, but I’m sorry to report that Lady Catherine Percy, daughter of the Duke and Duchess of Northumberland, and her husband Patrick Valentine, are divorcing. It was reported that the couple drifted apart just a year after tying the knot at Katie’s family home, Alnwick Castle, which was used as a filming location for Harry Potter and will feature in the new series of Downton Abbey. But now friends of the couple say the marriage is well and truly over. ‘Katie and Patrick split a while ago – Katie moved back home while Paddy stayed in London,’ says a source. ‘She preferred life at Alnwick but that wasn’t the only reason for the split. They wanted to make it work, of course, but that didn’t happen. It’s sad.’"
Heres's more, I guess I'm answering my own question and informing anyone interested along! There is a new woman in millionaire businessman Mark Carnegie's life and she has the sort of aristocratic pedigree fit for a blue-blood, let alone a modern day corporate prince in the antipodes. Carnegie has been spending "quality time" with Lady Catherine Percy, who at 35 is about two decades his junior and recently divorced from her own husband, London financier Patrick Valentine, after just over two years of marriage and following a society wedding that rivalled her good friend Prince William's. Lady Catherine just happens to be the Daughter of the Duke and Duchess of Northumberland and has been residing at her parents' home at Alnwick Castle — the bride's ancestral home which also doubles as Hogwarts in the Harry Potter films. Carnegie, who ended his 20-year marriage to Tanya, the mother of his three daughters a few years back, boasts his own impressive home in Darlinghurst, the old Christian Sciences Church which he has poured millions into converging into a cavernous home. And, if you squint and ignore the passing traffic and the occasional street walker, it could pass for a Palladian folly on a grand English estate. But admittedly, next to Alnwick Castle it's practically a garden shed. PS is still waiting for Carnegie to respond to queries about his new girlfriend, but friends say the romance has given him "renewed vigour". Lady Catherine is something of a trailblazer herself and is not your average English aristo, having a passion for restoring vintage motorcycles, she also has a passion for firearms, a sort of Annie Oakley of Sloane Square. But she is not adverse to dressing up in the impressive Percy family jewels, like the sparkling diamond tiara she wore on her wedding day. Indeed, if things get serious with Carnegie, she may want to avail herself of some of the discount sparklers from his own online jewellery business, the somewhat unfortunately named iceonline.com.au. " A very upper-crust ding-dong: The Earl's inherited the estate but his stepmother, the Dowager Countess, has the right to wander in at will - now both sides have hired a QC. No wonder they're called the 'Barmy' Bathursts!